Getting my red wine-loving husband to drink white wine is like trying to get a kid to eat spinach, so he was not exactly thrilled when I told him I was making white sangria. I talked it up, trying to get him interested in tasting something new, but he’s just not a white wine kind of guy. I, on the other hand, enjoy white wine and felt excited about the white sangria and the chunks of delicious fruit. 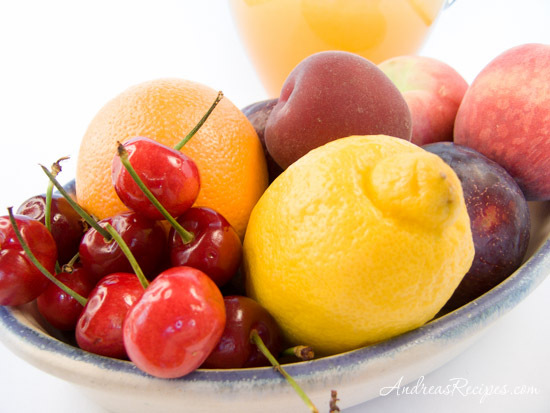 This recipe uses fresh plums, cherries, peaches, nectarines, oranges, and orange and lemon juice, then tops it all off with Amaretto and sparkling water, and I knew I had a winner when Michael went back for a second glass commenting on how good it tasted. This refreshing sangria goes well with seafood or light tapas. You can mix it up 12 hours ahead, and I love how the fruity flavors mingle with the wine when it’s had some resting time, but remember to hold the sparkling water until just before serving to preserve the bubbles. Reminder: There’s still time to enter the Spain and the World Table cookbook give away! Visit the original post and tell us about your favorite Spanish food or a Spanish food you want to try. The contest ends at 8 pm May 31! 1. In the small sauce pan, add the sugar and water and cook over medium heat until it starts to boil. Stir to dissolve the sugar and remove from heat. Allow to cool completely. 2. Stir together the white wine, orange juice, lemon juice, Amaretto, and the sugar water. Add the fruit and stir gently. 3. Add the sparkling water and serve immediately. Spoon some of the fruit into each glass then pour in the sangria. 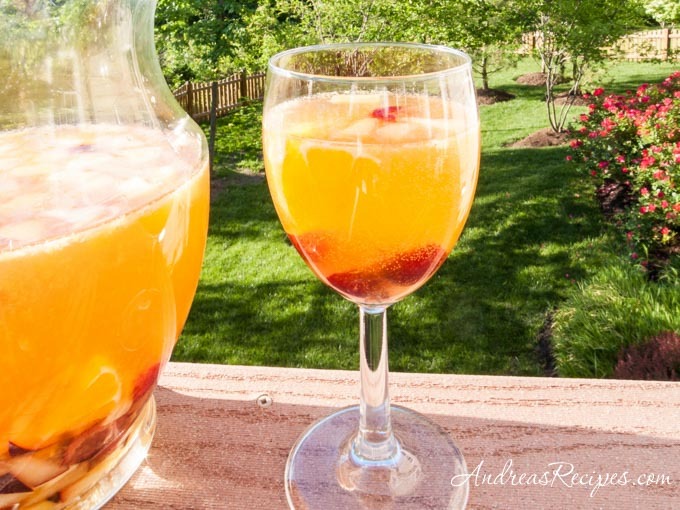 You can also chill the sangria for up to 12 hours, then add the sparkling water when serving. We’re 2 days from when our nights don’t go lower than 80°. We both turn to white wine and this would be most welcome! Lovely Andrea. I came across your blog, and I love the recipes on here. This sangria sounds refreshing. I’m wondering what type of white wine is best for the recipe. Thanks! We used a sauvignon blanc because we had one on hand, though fruity reislings would also work. Just avoid wines that say “dry” or “very dry” on the label. Late Summer night, not willing to go out, we made a White Sangria from a respectable Riesling and leftover coconut rum. Fresh thin slices of nectarines, peaches and plums soaked up the rum and superfine sugar at the bottom of our Acapulco pitcher. Topped off quickly with some ice, a little sparkling water and the Riesling. It was actually quite good. More like a punch, maybe. I love Sangria. There’s a restaurant in Tampa’s Ybor city that serves a wonderful Red Sangria. I can’t wait to try your recipe.